Stephen White is a quiet and thoughtful artist. Artists, in a sense that belies the freedom they claim for their art, are disciplined as well as independent. It is counter-intuitive but I think it may have been a combination of these virtues, discipline and independence, that enabled him, as a submariner, to live many months under the sea in close quarters to people he had not chosen to be with. I find this stillness and calm in the first Venice painting I bought. The colours are rich but gentle, like the Venetian light reflected off water onto ancient stones. The blues, turquoises and rose-pinks show a sensibility and an appreciation of beauty that is unexpected in a man but not in an artist. The accuracy of this impression demonstrates his care and quiet consideration of his subject; looking hard and steadily enough to communicate through the handling of the paint the atmosphere of old archways leading to secret places and the freshness of the light which penetrates them. In May he gave twelve works to Pallant House gallery to auction in in aid of Outside In. These Venetian paintings were large; dream-figures from the masque balls, pulsating with thick swirls of colour, close in on the viewer and then vanish, as if down a narrow venetian street. One painting stood out for me – Venice again, but this time the paint was sparingly used and the drawing, of the bones of the city and canal was visible, like a structure of scaffolding holding the image up. 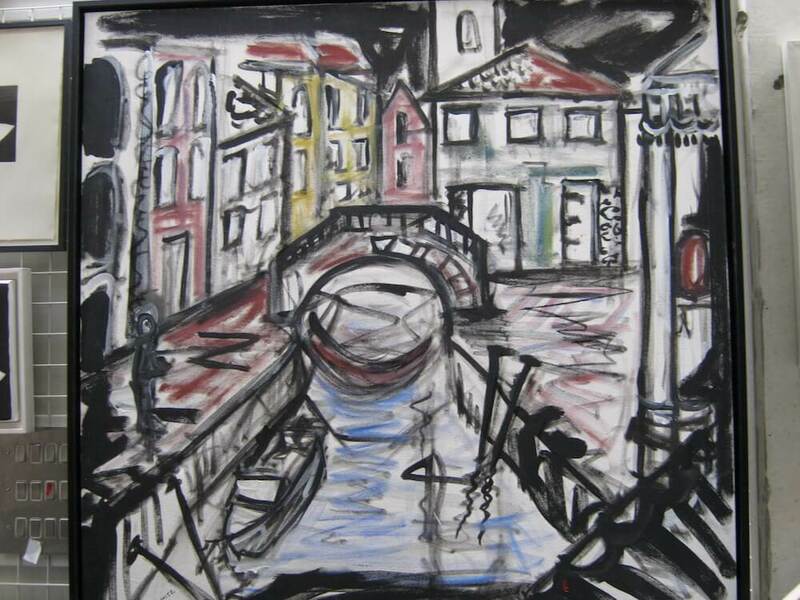 It reminded me of Auerbach’s drawings but at 100cm x 100 cm it is big enough to let the perspective of the scene stretch out; for the canal to moving away; under a bridge, between buildings and out of sight. There is space in the painting, for gondolas and gondoliers to inhabit the city as well as the bridges and arches and walls and windows. It has a grand plan; passers-by, a church, grand palazzos and narrow streets leading off into the dark while the sun still picks out the colours of the painted facades.